With Pia eating vegan most of the time these days, I am on a constant hunt to come up with more delicious and creative ideas for vegan dishes all the time. It also happened to be a top request from YOU GUYS around the beginning of the year when I was looking for requests for 2017. Many people wrote in that they needed more vegan and vegetarian main courses- I get it. I’m with you- we need that around here too! Falafel is one of my favorite things ever- crispy golden balls of a fried garbanzo bean combo that is tender and light on the inside. Garlicky and herbaceous and super full of flavor! Obviously the fried falafel makes me swoon, but you know, it’s January…. So I made you baked falafel!! (but psssst, you could totally fry these little balls up in 350 degree oil too!) And I have to tell you the baked version is absolutely delicious and still gets a really crispy on the outside- just the whole deal is happening with less oil! So that wins some January accolades, right!? Also, I am pretty sure the Tahini sauce is mandatory. I don’t dip the falafel in it so much as I dunk them in it. Like three or four times. And the tahini sauce adds the best flavor ever. I also love that you can make a big batch of these and then take a couple of them with you for lunch at work, add them to salads or I am just snacking on them too. However you want to enjoy these, you will LOVE em. Soak the chickpeas with water for at least 8 hours and up to 24 hours. Drain the chickpeas. In the bowl of a food processor add the garlic cloves and pulse until minced. Add the beans, red onion, cumin and kosher salt. Pulse until the beans are ½ way broken down. Add the parsley, cilantro and lemon juice and continue pulsing until the mixture is still crumbly but if you press it together it will stay. Form the mixture into 12 balls and then place them evenly spaced on a sheet pan. Gently pat them down with the palm of your hand so that they make a patty shape. 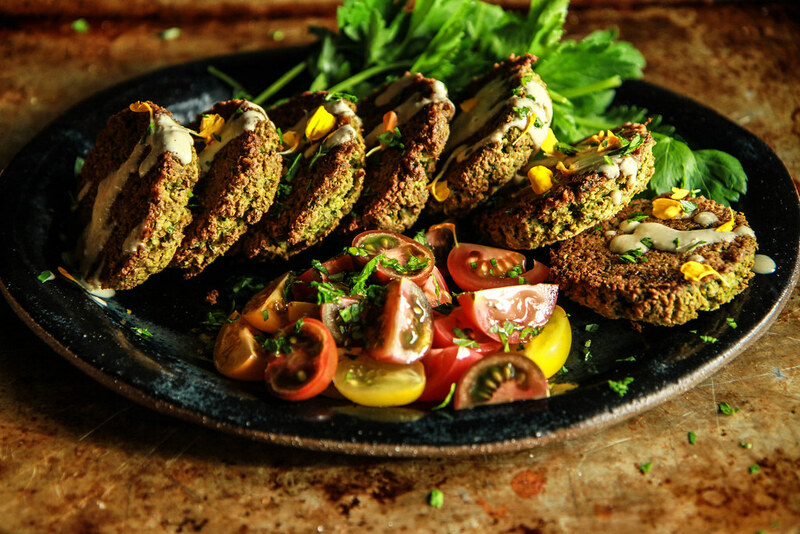 Use the ⅓ cup of olive oil to generously brush both sides of each falafel patty. Bake the falafel for 12 minutes on each side until golden and crispy. 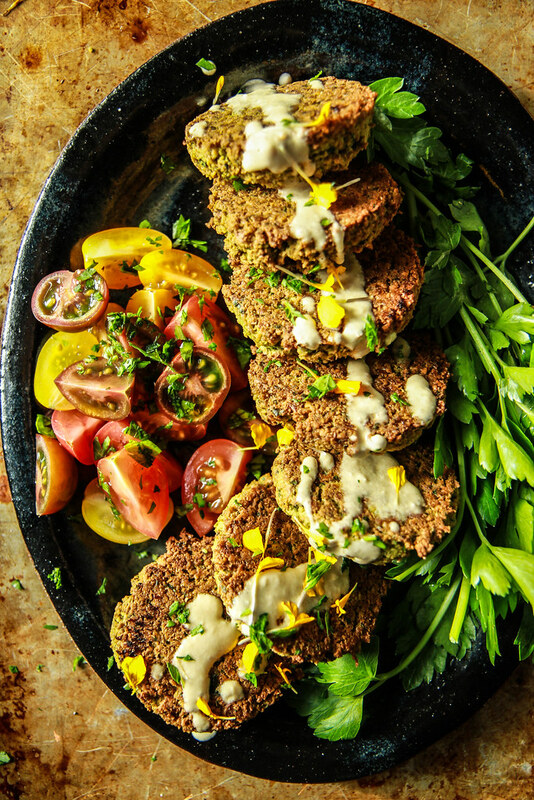 While the falafel is baking, make the Lemon Tahini sauce. In the jar of a blender combine the garlic, tahini, lemon juice, hot water and olive oil. Puree on high until smooth and season to taste with kosher salt. 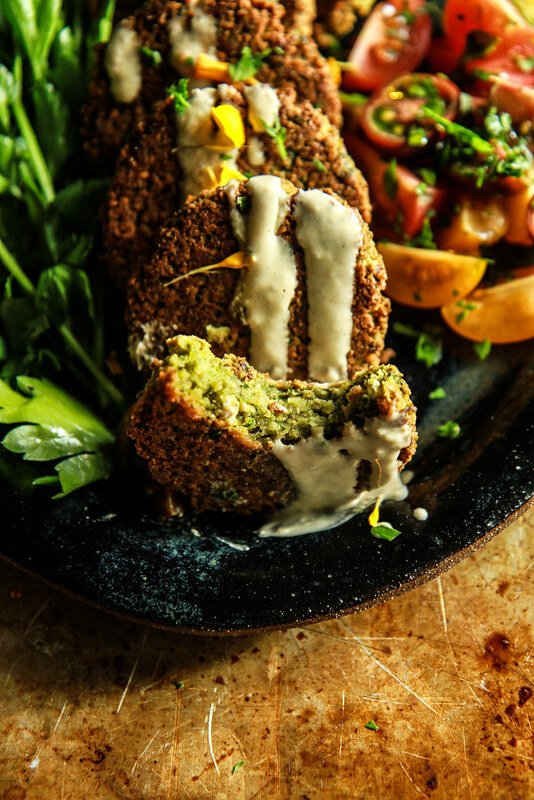 Serve the hot crispy falafel with the lemon tahini dipping sauce. I’ve got to try this recipe soon! Yum! Can I also used canned garbanzos? What would be the equivalent volume in canned garbanzo beans versus the dried? Adding this recipe to my to-do list when I get home! Omg! These looks so delicious! drooling! Your photographs are always so beautiful! This looks amazing – especially with the tahini sauce! These look delicious! I’m just on the hunt for vegan recipes and ideas and me and SO have decided it’s past time to go down that lane, anyhow, do you recon the batter or even when they’re already baked would freeze/defrost ok? I was thinking to make them into patties, freeze, take out when needed, defrost and then bake? Hi Carina- I would leave them in the fridge up to 4 days? And I think freezing them is a great option! With regards to freezing, do you think it’s okay to freeze the uncooked batter prior to cooking (defrost a few patties at a time, then bake), or better to first cook all the patties then freeze (defrost a few patties, then reheat)? Hi Trish! I have not done this yet, but I would cook first and then defrost and reheat! Hi there, I have never used dried chickpeas before so I decided to try it. I put them in a bowl of water to soak yesterday and they have now been soaking for almost 24 hours and are still quite hard. Shouldn’t they be soft enough to mash by now? They will still be hard when they go in the food processor Kasia! Made this falafel recipe and it was a big FAIL!!!! I was so excited to dive right in and it fell right apart. I followed the recipe precisely and I was disappointed with the outcome. Don’t not make this recipe!!!!! Hi Tia- listen, this recipe absolutely works well and has been successful for lots of people. I am happy to try to troubleshoot what went wrong for you, but it is not a total recipe fail. Just made my first batch. the flavor is spot on, and my 1 year old seems to like them! but they do tend to crumble. I did half a batch first as a test run and carefully followed the instructions. Any thoughts on why they crumble? Thank you so much for this recipe — this is what I have been searching for! I’ll be making this many times! So easy, and so delicious. I made a couple of batches, and I noticed that if I added most of the frying oil after things were pretty sizzling, I liked the texture better. Putting it all on when the patties were very cold seemed to mean that the old soaked into the patty, making it more dense than I wanted.